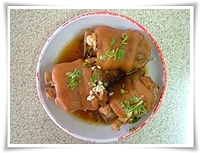 The most famous Meinong Hakka cuisine is the broad rice noodles and pig knuckles. 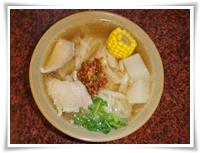 Nonetheless, the traditional Hakka pig intestine mix, fried pig stomach, steamed Fen-Chang, cabbage seal, wax gourd seal, Fu Cai, and wild lotus, are also are popular dishes of Meinong. 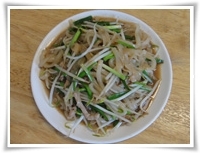 Meinong Broad Rice Noodles- this noodle is made from rice and sweet potato flour. The finished product looks like sheets of towels before it is cut in thin strips; therefore, the Hakka people call it the towel noodle. 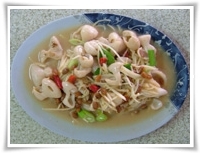 The broth used to cook the broad rice noodles is made from a slow simmer of bones. The process extract all the nutrients in the bones into the soup. 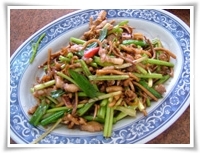 Added with fried spring onions and meat slices, a bowl of delicious Hakka broad rice noodles is ready for the table. 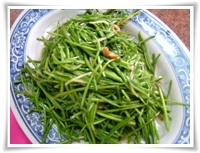 Hakka Leicha was a tea snack common to the life in Hakka village. 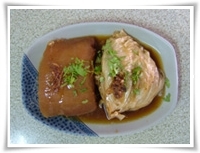 It is one of the most representative gourmet in the rich Hakka food culture. The simple and graceful way of making Leicha fully represents Hakka's heritage from the ancient Chinese traditions. 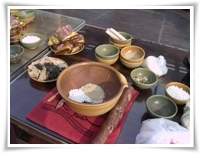 It is time-consuming and labor-intensive to grind and brew Leicha; therefore, it provides a great opportunity for casual chats, so close ties grow in the communities. Feel free to take a sit and experience the Meinong way of life while you are in town.